When in doubt, read an Amy Tan book. Really, is there anyone out there who dislikes Amy Tan? She’s not my absolute favorite author, and I wouldn’t say that her books are the best books I’ve ever read…but they’re reliably and consistently good. 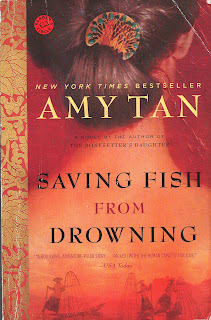 A couple weeks ago, LLC brought me Saving Fish From Drowning, which was (conveniently) the one of the only Amy Tan books I had not read. I started reading and was immediately reminded of what a great writer Tan really is! She is truly a storytelling expert. Her books are always about China in some way, and women (but they’re definitely not “chick” books – much more sophisticated than that). Saving Fish From Drowning is no exception. First of all, the mode of story-telling is really clever. The narrator is a recently murdered socialite who had planned a trip to China and Burma for her friends. Thus, the narrator is a character (Bibi Chen), but she also has complete access to all the other characters’ thoughts and actions. Think of it as first-person omniscient, with an extra dose of sassiness. It’s less about women than her other books – I mean, the narrator is a woman, and there is a mother-daughter relationship (Tan’s insertion of her own childhood into the story perhaps…) but overall it is quite balanced, gender-speaking. Like I said, the mode is really interesting because you know everything about everyone. And it give Tan the opportunity/challenge of fully developing 12 different main characters (11 tourists + the narrator). She does a very good job of this…though I often got confused who was who (e.g. is Moff the dog trainer man? Was Barry the one bossing everyone around at the beginning of the trip?). I almost wanted a character guide to reference as I read. But as the story continues, you get to know all the characters, and they distinguish themselves from each other. It’s kind of like getting to know real people – it would be easy if you knew everything about everyone from the start, and could remember their names and the details of their lives. Then you would know immediately if you liked/disliked them, where they’re coming from, etc. But inconveniently, life doesn’t quite work that way (I suppose that’s why we have things like dating), and neither does reading. And the title is really very clever. It reflects on the story itself - a group of people, each with their own issues to overcome, trying to find their way through the world. Bibi Chen, the dead and overseeing narrator is kind of like the fisherman, trying to save them...It also speaks to the plight of Burma/Myanmar. 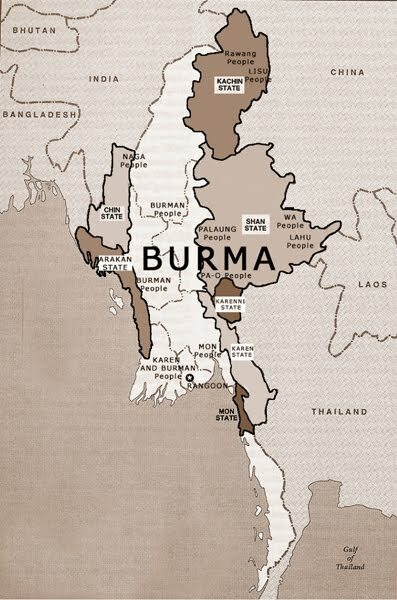 Burma/Myanmar has always been ethnically diverse and politically divided. It was conquered by British imperialists in 1886. 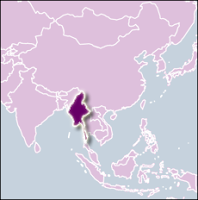 Later, during WWII, the Burmese and Japanese teamed up to fight the British out of Burma, and Burma declared its independence in 1943. However, the deal with the Japanese went sour (aka, Japan was trying to take over the world - its allies included), and so in 1945 the Burmese teamed up with the British to kick out the Japanese (I know, kind of odd, right?). Finally in 1946, Britain recognized Burma's independence. A couple military coups and socialist failures later, Burma found itself under the oppressive rule of the State Law and Order Restoration Council (SLORC). When SLORC lost elections to Aung San Suu Kyi in 1990, it refused to turn over power. Military junta, oppressive rule, child soldiers, no human rights...unfortunately you know the drill. President Bush imposed sanctions in 2007, and more recently the UN Human Rights Council committed to addressing the issue of the house arrest of Aung San Suu Kui and other political prisoners. So that's the mini-history for you. I have a line-up of Burma books on my shelf right now (thank you LLC! ), so look forward to more posts on this subject in the future! I don't have any recipes for you yet, but don't you worry - they are on their way! Woah - Sidenote! 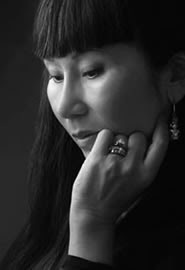 According to Wikipedia, Amy Tan "is a member of the Rock Bottom Remainders, a rock band consisting of published writers, including Barbara Kingsolver, Matt Groening, Dave Barry and Stephen King, among others." COOL!!! The Hundred Secret Senses (1995) - This is the only one I haven't read yet. Anyone have a copy I can borrow?